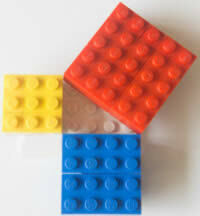 Example: The smallest Pythagorean Triple is 3, 4 and 5. Yes, it is a Pythagorean Triple! When a triangle's sides are a Pythagorean Triple it is a right angled triangle. See Pythagoras' Theorem for more details. And each triangle has a right angle! The simplest way to create further Pythagorean Triples is to scale up a set of triples.